We know you need a top of the line draper header. That’s why we’ve taken the time to make sure no detail has been overlooked in the design of our 5300 series headers. No matter what your operation needs, you can rest assured any of our 5300 Series headers will get the job done quickly and easily. WR SERIES WINDROWERS: Our 5300 draper headers have the capability to handle any operation. AUTO REEL SPEED: The hydraulic variable speed reel drive automatically adjusts reel speed based on ground speed so that crop feeding is maintained regardless of ground speed changes, while also keeping shatter manageable. MATCHING UP: Massey Ferguson offers 5 header models ranging from 20’ to 40’ in the 5300 lineup, all of which are compatible with any WR9800 series swathers. Selecting the right 5300 model is easy, while still giving you the ability to use the swather as a hay machine. SINGLE POINT HOOKUP: Single point hydraulic hook up is standard with the 5300 header, making it much faster, and easier to hook and unhook the hydraulic lines for transport, storage or when swapping to a hay header. PULL, NOT PUSH: We’ve moved the draper belt drive motor to the inside of the header and placed a rubber coating on the drive rolls so the belts are “pulled, not pushed”. This means the draper belts resist slipping so crop continues feeding no matter the conditions. CENTER DELIVERY OR DOUBLE SWATH: Massey Ferguson offers center delivery or double swath models. Double swath models are equipped with shiftable decks that allow the swath to be dumped out either side. All shifting is done from the cab and you get the ability to retain the 78.5” opening even when decks are shifted for end delivery. 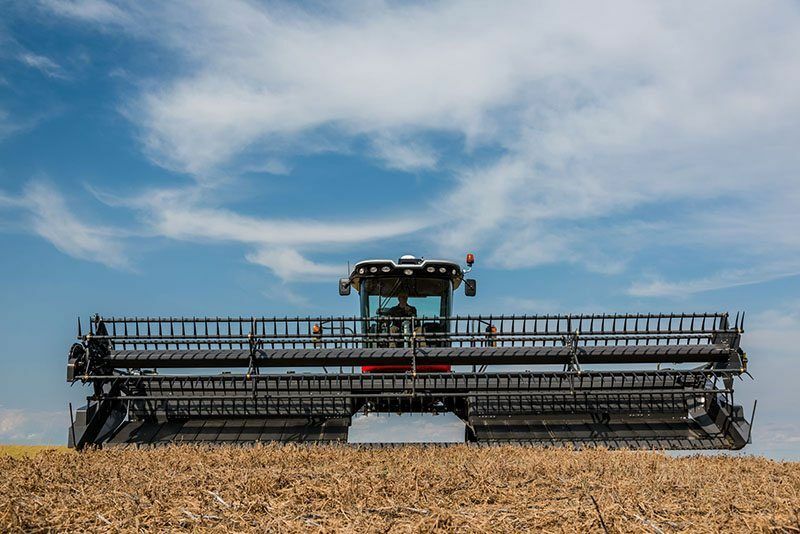 5300 SERIES DRAPER HEADER: With our innovative 5300 draper headers you’ll experience performance that’s second to none, with industry-leading ease of use and operation. OPEN WIDE: Consistent windrow formation starts with the deck opening. That's why the 5300 offers the widest deck opening in the industry at 78.5 inches. This provides increased capacity with the header so even heavy, bushy crops can easily move through to the swath. HYDRAULIC SICKLE DRIVE: Our hydraulic sickle drive provides 1,470 strokes per minute to the sickle at all times, not just peak starting and stopping loads. Meaning you can easily cut through tough, heavy crops with reduced horsepower pull from the windrower, lengthening the service life of the drive. TINES AND PITCH ADJUSTMENT: In order to enhance reel performance, we fit our reels with large virtually break-proof tines. These tines will positively capture and feed crop regardless of how tangled conditions get. We also provide a standard tine pitch adjustment so reel performance is always optimized. HEAVY-DUTY REEL: Our 5300 draper headers utilize a single-piece Hesston designed and built reel assembly, allowing for unmatched quality control throughout the entire process. So you get a reel that will easily power through and feed any crop, even in tough, tangled conditions.